All is going well. Really. Considering everything my body has been through, and the fact that my small intestine is now serving a completely different purpose than science designated it to; I am happy. I can't believe it's only been four months since surgery. FOUR. It's incredible. Life is incredible. And science and medicine are mind-boggling. The only hiccup in the road has been the onset of pouchitis, almost immediately after I got home from Palms. Pouchitis is a common infection that is extremely treatable with antibiotics. Thank God. It's actually quiet unusual for someone with Crohn's to feel an immediate, drastic improvement just from popping one of medicines' oldest tricks in the book. With Crohn's, you're used to feeling months of misery, complete with trial and error. Mostly error. Pouchitis, quite simply, is inflammation of the lining of your pouch. For me, this is the internal reservoir that was created when I had the BCIR. It's something the nurses and doctors prepared me for. The first year after surgery it is quite common and I have developed a chronic case of pouchitis that will require me to remain on a therapeutic level of antibiotics for the time being. I've heard about pouchitis for years and have come to terms with the varying degrees of it. People with the K Pouch and J Pouch often experience it as well. For me the pouchitis merely causes more cramping than usual. I get more prone to dehydration because I am intubating five times a day instead of two. The weirdest part of pouchitis is that (for me) it is NOTHING in comparison to what I thought it would be. Regardless of my access to a bathroom, I can endure the ebb and flow of the cramps until I am able to get to one. My tiny, pencil thin stoma, if you can even call it that, remains continent. I have to change my dressing more frequently but the fluid it excretes is merely fluid. It is not stool, it is just mucous that develops because my pouch is contracting more than usual. After a few days on antibiotics, I was completely back to normal. Since then we tried to wean my dosage but were unsuccessful. So I had a few days of cramping until the full dosage kicked back in. 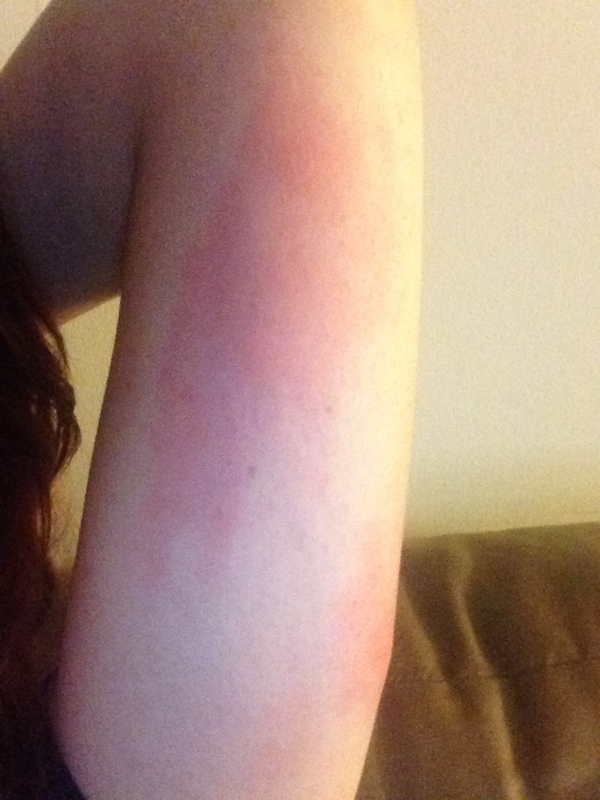 And then, several weeks ago at work, I began to have a rapid progression of hives forming on my arms. 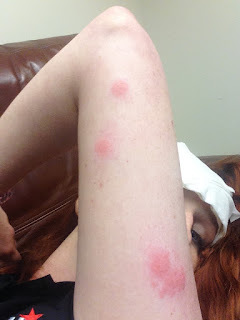 I was ignoring tiny red spots that were appearing for the weeks prior because they went away hours after they appeared. But these ones were getting bigger, redder, itchier, and uglier by the minute. I admit I freaked out a little bit and I am sure it was not helped by my coworkers freaking out for me. Anyway, I suspected that my body was rejecting the Cipro, which is common with long-term use and that fact was confirmed once my doctor returned my call. They switched me to Flagyl which took a bit longer to "work" for me so I had about a week of discomfort before I felt well again. In the end, I got quite a bit of sympathy at work. I laid down in an office while I waited for my doctor to return my call. I have an extremely supportive and laid-back office environment and after taking two benadryl my coworkers let me fall asleep until someone came at 5:30 to wake me up because it was time to go home. In the end, I was a little bit embarrassed. But I will take the embarrassment of hives and falling asleep on my bosses couch over shitting myself any day. 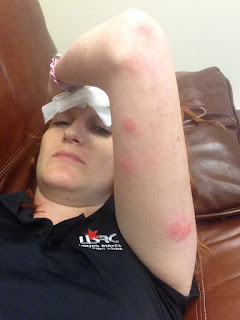 A few pictures below will give you an idea of what I was dealing with.